Seadrift is situated just off the A87 between Dornie (which boasts the world famous Eilean Donan Castle) and Balmacara which is just 3 miles from Kyle of Lochalsh. Carry on the A87 over the bridge in Dornie. After about 2 miles turn left – signposted Nostie and Dornie. There is a bus shelter at this junction and also our low level Seadrift sign. Continue on the A87 for about 4 miles, and once you have driven through Balmacara and Auchtertyre, take the next right hand turn signposted to Avernish and Nostie. There is a bus shelter at this junction and our low level Seadrift sign on the right. Once you have turned off the main road follow the signs to Seadrift. We share the upper part of our drive with Seathrift, and then bear left to Seadrift and stop before you hit the water!!!! 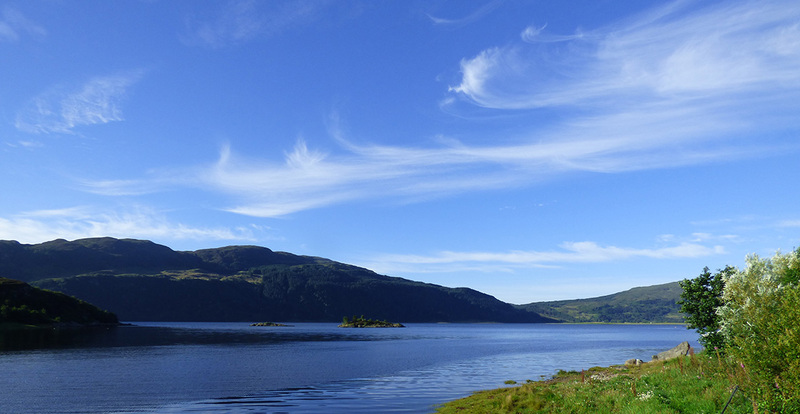 There is a daily rail service from Inverness which has some of the most scenic veiws in scotland when you arrive in Kyle of Lochalsh you can get a local Taxi to take you to Seadrift. There is a bus stop at the junction of the A87 and the turning to Avernish – check the timetable online.